MAG member Tony Moore introduces us to a recently launched voluntary initiative, Blood Bike East. Tony is an ex army motorcycle instructor who owns and runs motorcycletraining.ie and is a co-founder of training group initialbasictraining.ie. An RSA approved ADI, Tony’s been instructing for over 25 years. He’s also an ex racer and contributor to Bike Buyers Guide as well as instructor/assessor for Blood Bike East. 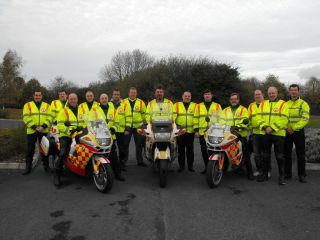 Blood bike east was set up to to save the HSE, or to be more precise your local hospital (and you the tax payer) money. The money that’s saved can be put back into front line services. This means an extra nurse on the ward or beds on the wards being used. Every hospital receives a finite budget from the HSE every year. What most people don’t realise is nearly 75% of the budget goes in wages and whatever is left has to pay for everything else – electricity, waste disposal, heating etc. One of the biggest costs to the hospitals is the transporting of blood samples, medical files etc., after hours. This would normally be done by taxis and courier companies at a huge cost to the hospital involved. The hospitals use their own staff and vehicles during the day. Our mission is to act as Emergency Rider Voluntary Service which aims to relieve sickness and protect health by the provision of transport of urgently needed blood, blood products, breast milk, patient records, drugs, urgent medical equipment and other medical requirements between hospitals and blood transfusion banks in Leinster. Blood Bike East was set up in September 2012 by a group of like minded bikers that wanted to give something back to society. We are looking for volunteer riders and helpers. Volunteer Riders Wanted – Do you have what it takes? In the months since we started we have been very busy behind the scenes. We now have two bikes thanks to our sponsors and we have a panel of riders (and we need more!) nearly ready to go for our predicted launch in April 2013. It takes a panel of 30 riders to cover one month on one bike, if everyone on the panel does one night per month, 60 if we use two bikes and so on. Riders will be on duty from seven in the evening till seven the following morning. hold at least a R.O.S.P.A. silver qualification. R.O.S.P.A. training (at a reduced rate) can be provided by our in house training and assessment instructors. We would be looking for a two year commitment to blood bikes when you join. 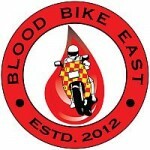 Blood Bike East is a registered charity (Charity No: CHY20552). No one, including directors, secretary, treasurer, riders or helpers receives any profit or reward for their time. Every euro we get goes into running the bikes. You don’t even have to be able to ride a bike to help out. Its a great charity and it also involves motorcycles, what more could you ask for? If you feel you can spare the time 1 to 2 nights per month to volunteer then send us an email using the contact details below.